Well June is here in all its glory. It’s birthday month for my sister, Janice, (and my husband, but she has to take priority). Notice “month,” as she feels that it takes a month now to make up for her childhood. I’ll explain. When I was a little girl, June meant a trip to Guntersville, Alabama, for the annual family vacation with grandparents. But actually it was the annual fishing trip for my dad and my uncles. For you see, the willow flies hatched the week of Janice’s birthday, and that was the appointed week where the brim fish were over-plentiful. The catch was always good and abundant. As long as we were living at home, we would make the annual trip during her birthday week. We referred to her week as willow fly week. And while we would celebrate with all the trimmings, she still felt overshadowed by the fishing events. I guess she is still sensitive today, but we don’t ask. While we grandchildren were not out in the boat on Guntersville Lake with the grownups, we had our own little fishing fun. Granddad Hill would load us up in his gigantic Chevy, with cane poles hanging out the windows, and we would speed down the winding mountain to the dam at the lake. For right there was the best pole fishing in the world, according to him. We used bread balls on the hooks and brought in our own abundant catch of tiny fish. They were not even bite size, but we had a ball catching them. We brought them back to the farm and proceeded to clean them for cooking. Mom confessed to us, years later, that she kept a wonderful supply on fish sticks on hand and cooked them in the oven. We thought we were eating our catch and enjoyed every bite. Theses are great memories of wonderful June days. But now it’s back to the present. It is time to plan the parties for Janice and Neal. I was reminded of this very thing when the latest issue of Entertain Decorate Celebrate magazine arrived. It is the birthday issue, and a scrumptious slice of white confetti birthday cake adorns the cover. It starts with a mix, and with just a few added ingredients, it is a fabulous cake. White cake is perfect and my favorite, but the Mocha Cake will delight the chocolate fans. There are several scrumptious cakes that will turn any day into a special day. We will begin our month of celebrating and hope that you will enjoy the ideas and tips in the new issue. Preheat oven to 350°. Spray 3 (9-inch) round cake pans with baking spray with flour. In a large bowl, beat cake mix and next 3 ingredients with a mixer at medium speed until creamy. Beat in sour cream and almond extract until smooth. Divide batter among prepared pans, and bake for 18 to 22 minutes or until a wooden pick inserted in center comes out clean. Let cool in pans for 10 minutes. Remove from pans, and let cool completely on wire racks. 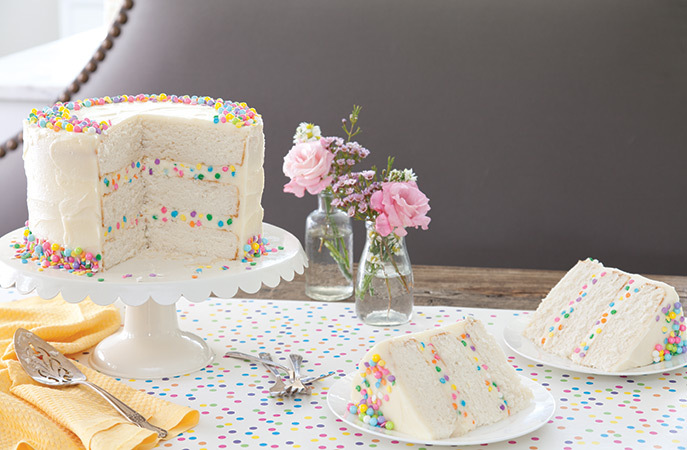 Spread reserved Silky Buttercream with confetti between layers. Frost top and sides of cake with remaining Silky Buttercream. Garnish with edible pearls and confetti, as desired. *We used Duncan Hines White Cake Mix. In the top of a double boiler, whisk together sugar and egg whites; place over simmering water. Cook sugar mixture until a candy thermometer registers 140°. Remove from heat. Immediately pour mixture into the bowl of a stand mixer fitted with the whisk attachment. Beat on high speed for 10 minutes. Reduce speed to medium-low, and add butter, 1 tablespoon at a time, beating until combined after each addition. Spoon 1½ cups frosting into a small bowl. Stir in confetti and use in layers. Use immediately. Phyllis, I have a Wonderful idea for celebrating birthdays. However many years old you will be on this birthday, begin celebrating that many days BEFORE your birthday and that many days AFTER your birthday. If you live long enough, you’ll be celebrating MUCH of the year! Isn’t that a lovely idea?! BTW, it’s your responsibility to get the celebrations started!! This cake is beautiful. I just made it to celebrate our wedding anniversary this evening. The photo was so beautiful it made me sign up for a subscription. Your fish story is so sweet and I am sure you laugh about it now. The cake looks delicious! Thanks for the inspirational recipe and nostalgia. Oh, my goodness! What a wonderful story about your annual trip and “fish” dinners!! All my best to your sister (and, her husband). ~ Donna E.
Today would have been Daddy’s 92nd Birthday. Your fishing story bought to mind a number of wonderful memories; especially, how Mother & Daddy used to fish early in the morning when the Bream were biting. I would be bundled into the backseat of our car still asleep to awaken to the sounds of my parents and their friends enjoying the fellowship. Boiled eggs for breakfast never tasted so good! And we kiddos sometimes had the joy of pulling in the fish as fast as we could drop our hooks. Simple pleasures, indeed. I love this story (and this cake)! My husband always seems to think his birthday is a least a week long celebration. I never understood that, but now I wonder also if there’s a reason behind that from his own childhood. Come to think of it, there are a lot of birthdays in his family, all right around the same time. Morn’n Phyllis, Loved the cake and its grand presentation! What a statement it makes, thanks for the recipe I plan on making it for overnight guests and write “Welcome” on top. The confetti Cake with a cup of coffee after a grand dinner will really make them feel special. We always go to Idaho for our Gran daughter’s Birthday and she requests us to bring 33 cupcakes for all of her classmates to enjoy her Birthday with her. It was a thrill for us to go to her school and do this for her at 8 years old. Little girls are all little princesses and we just love them….thanks for the Birthday message and I shall pick up the magazine today! Happy Birthday month to you and Hoffman Publishing. What heartwarming stories! Phyllis, growing up, I think all of us would have loved to have had you as a friend! Now your friendship lives through your wonderful blog! Many thanks!!! Well my 1st grandchild was born on June 4th so that’s a wonderful memory! However, even though I can’t remember when anyone else was born, I remember vividly when Janice was born! We went to your house so my mom could help your mom, maybe our dads went fishing? But you, Keith, Nancy & I had such fun making mud pies in your moms flower bed right in front of the house! We have reasons to be thankful every day during this glorious time of year ! As for birthdays – no matter the month – one should always commemorate the day in a special way . Take time , make time for your loved ones as well as yourself. Birthdays are reminders for us to celebrate the goodness of life’s treasures – one another ! It’s nice to hear about fellow June babies. In some ways I too felt “deprived” as a June birthday girl but for a very different reason. Back, many years ago, in elementary school, of course birthdays would have NEVER been celebrated once we got to middle school, we were far too “grown up” for that, all the kids who had a birthday during the school year would have their mothers arrive with birthday cupcakes or something like that. Having a birthday that was on the 29th of June of course we were out of school for the year by that time. That was long before someone, most likely a teacher, invented the concept of the “unbirthday” party to include us summer kids. Just like Sesame Street, it was after my time when it would have done any good for me. It wasn’t until my 12th birthday that I had a BIG party that all my friends from school were invited. Another thing in our family is that I was born ON my parent’s first anniversary. I don’t know what it is in our family but there is not one single birthday, even with in-laws that the birthday doesn’t fall on or very close to another birthday or event. Even for anniversaries, while my great-grandparents were still living their wedding anniversary was on the 27th. June has always been a very busy month. We had not one but two family reunions, Father’s Day, birthday, anniversaries and who knows what else. May is usually even worse. I guess those are the events that help make families and the events that make memories. Over the years there are lots of cute stories that would me nothing to outsiders let alone be funny or emotional and lots of crazy pictures which I’m sure, down the road in about 3 or 4 generations when all of us living now are just obscure names that mean nothing to those 75 to 100 years later, will be tossed and no longer exist. But for now, we enjoy them and still at times laugh about birthday or holiday events in the family. It is our Birthday Month also. My grandson, brother, daughter, sister-in-law, son-in-law and me all are June babies. June is like Christmas at our house. We all love celebrating and sharing the month together. I throughly enjoyed your article. My sisters birthday is in June as well. She is a joy to all that know her and we are blessed to have her in out lives. Since she is the ‘baby’ in a family with three girls and much younger than my sister and I, she has always held a special place in my parents hearts (as well as mine:). Her birthday and Fathers Day are now celebrated on the same day when the family gets together, but growing up her birthday was always a special occasion for the family with mom preparing a wonderful homemade cake. 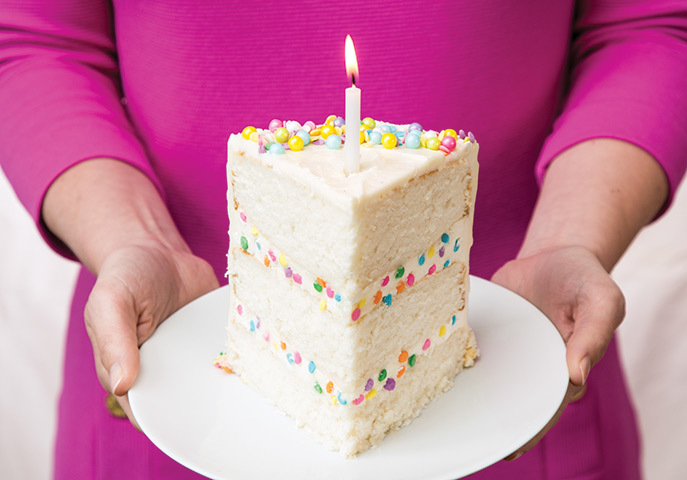 The confetti cake sounds wonderful and it may be her birthday cake this year. Thanks for the wonderful article. My grandpa was an outdoorsmen and he lived by the dam is sacramento and he would take us fishing too. Such great memories! I am going to make this cake for mr grand daughters birthday, looks delicious! Thank you. 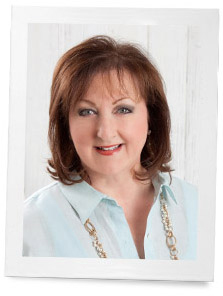 Love your column on Birthday Month! A few years ago my husband began to declare his birthday month (May) as one to be celebrated all month long. And he is an only child! What was I to do when a milestone, which i will not reveal, came along? I organised a party and made the Pink Velvet Cake with Vanilla Swiss Meringue Buttercream from the Jan/Feb 2014 issue. Everyone raved about it and he declared it his favorite cake!! My daughter-in-law even asked for the recipe. Love this post! Your poor sister, I can understand why she felt “robbed” growing up, Phyllis. It sounds like such a fun time though, your family fishing vacation. June was the birthday month for my Mom, and I miss her especially on that day, but also the birthday month of my beloved Mr. FGH. I try to make each birthday celebration special, today we are going to cruise the Newport harbor on an electric boat with our children and grandchildren for a birthday surprise picnic lunch for him. I love to fish! I also love birthday cake, wedding cake, any cake, just about. In Tennessee we spell it bream! In Tennessee we also say “crappie……….first syllable rhymes with craw without the w! My husband is from Alabama as are most of his relatives and they pronounce that delicious little fish the way it looks, crap…..pie. We co-exist even with the football rivalry. When TN-AL play we always have a small bet. Yes, he has won much more than I !!! : ) Love your blog.